My first meal in China was at one of the best Sichuan (Szechwan) restaurant in Beijing, Yu Xin. Straight off the plane, Eric and Christina wasted no time in tossing my stomach into the fire, literally. The spiciness of real Sichuan cuisine comes from mala, a spicy sauce of Chinese chilies and assorted seasonings like sesame oil and Sichuan peppercorns. The word "ma" refers to numbness, the word "la" to the spiciness, so mala spells out its effect: it burns and numbs at the same time. The numbness actually allows you to eat more of it than you would otherwise. The first dish that came out was a meat dish, but it was unclear from its appearance what the dish contained other than diced chilies. I had to send my chopsticks burrowing deep into the mountain of chilies to find a chunk of chicken. By the end of the meal I'd lost all feeling in my mouth, but that didn't wipe the big grin off my jetlagged face. The problem with eating lots of mala is that all other types of food taste bland in comparison. The toughest restaurant to get a table at in all of China? Kentucky Fried Chicken (ken da ji). Far more popular than McDonald's. It's so popular that another chain of restaurants knocked off KFC's logo, colors, and mascot. Yes, there's another restaurant with a Chinese-looking colonel and the white lettering on red background, but that restaurant doesn't serve fried chicken at all. I didn't have time to walk into one to see what they served, but its existence seemed appropriate in a place where respect for copyrights is about as scarce as toilet paper in public bathrooms. The hottest new American export to the Chinese dining scene since my last visit? Starbucks ("xing ba ke" in Chinese, xing meaning "star" and ba ke simply being a phonetic rendering of bucks). There's one in the Forbidden City. We stayed with Joannie's friend Arthur and his wife in Guangzhou. We asked him what he liked to do for fun, when he wasn't cranking out sneakers for Nike (he worked at a supplier to the Swoosh). He said his favorite event of the month was every other week, when he and his wife would drive 45 minutes to an hour into the heart of the city to get Starbucks. In China people actually don't use soy sauce much. Soy sauce and egg rolls and General Tso's chicken, they're all largely staples of the Americanized version of Chinese food. In China, they prefer vinegar use it instead of soy sauce as seasoning, for example, for dumplings. My visit two weeks ago to Beijing was another culinary adventure. Christina and Eric are among the more passionate foodies in my circle of friends, and the week's worth of activities they organized for everyone leading up to their wedding included visits to many of their favorite restaurants. That was music to my mouth. I don't look forward to the cuisine in every country I visit (many of the stops on my E. European visit earlier this year left much to be desired from a dining perspective), but China is a culinary mecca. On my visits there, I look forward to eating as much as or more than sightseeing. Our first lunch was at Lei Garden, a fairly new restaurant to Beijing. I don't believe it was there last year when I visited, but it's the newest branch of a high-end Cantonese restaurant chain that first achieved renown in Singapore. For those who love Chinese food but don't possess the most adventurous of palates, this is the perfect restaurant. The restaurant, tucked away on the third floor of a somewhat sober business building, is elegant and polished, and the service is top-notch. As for the food, when I found out we were returning to Lei Garden for the rehearsal dinner, I delivered a celebratory chest bump to the next guy I saw in the street, sending him scampering away in fear. For one of our dinners, we visited the Qianmen branch of Quan Ju De (English website), the famous Beijing (Peking) duck restaurant. 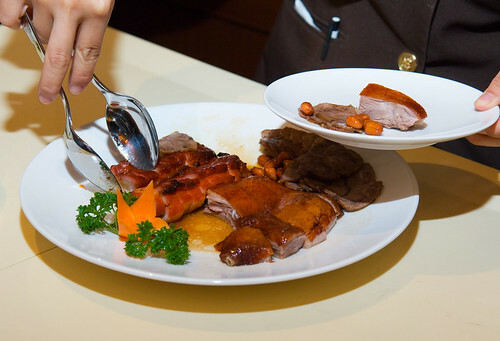 Roasted over a fruitwood flame, the duck arrives with a crispy skin and tender, juicy meat. Carved tableside and served in a wrap with scallion and plum sauce, it's a dish I can never pass on. Quan Ju De has the reputation of being the top roast duck purveyor in Beijing, though there are whispers of declining quality and worthy challengers. If you're only in town for a quick vacation, though, it's the safe choice. Our dinner the next night was at Qiao Jiang Nan. What I remember most about our meal here, in a private banquet room, was that all the waitresses were wearing one-piece tennis outfits, much like the one Nicole Vaidisova is sporting here. I realize this seems like an excuse to reuse this picture of Nicole, but this is honestly the first photo of this type of outfit I could find. At any rate, I felt like we were eating at the clubhouse at Wimbledon. Perhaps my favorite meal of the trip was at Ding Ding Xiang, a Mongolian hotpot restaurant which bills itself as "Hotpot Paradise." It's not boasting if it's true. It instantly moves onto my list of restaurants and dishes that will haunt me forever. My second day back from China, I actually did have a dream about eating there again, and when I woke up I nearly cried at the cold slap of reality. At Ding Ding Xiang, everyone gets their own personal hotpot, set on top of a flame. Each diner can select one of several different broths to serve as the base of their hotpot. Christina helped Jed and I out and chose the mushroom stock. I saw abalone on the menu and had to order it, despite it being the priciest of the dishes. I adore abalone. The waiter actually brought it out for our perusal, and it was still moving! I'd never seen one live before. We also ordered lamb, a whole slew of mushrooms, spinach and other greens, and a whole lot more. The presentation was gorgeous, and the hotpot was simply the most delicious I've ever had, and I've had more than my fair share over the years. I'll be dreaming about that meal for years to come, and it is unequivocally my top restaurant recommendation from this visit to Beijing. The next time I visit, it will be my first stop upon leaving the airport. As for changes from my visit last year, the Starbucks in the Forbidden City is no longer there. Our guide told us the Congress over there gave it the boot. All the other branches of Starbucks remain a huge hit, however, and Kentucky Fried Chicken is still the king of the fast food restaurants in China. I did not eat there this trip, but I am also not one of those foodie or travel snobs who turns their nose up in disgust at the mere sight of a KFC or McDonald's. I think it's somewhat of a waste to spend a meal at McDonald's or KFC when abroad, especially when most of what they serve is available back home. But, even as an American, I don't flog myself every time I spot a branch abroad, and I no longer recoil in horror if someone has to duck in under the Golden Arches for the taste of something familiar. The typical travel snob who holds everything foreign on a pedestal can't ignore that most American fast food franchises abroad stay in business primarily through the traffic from locals. I find it interesting to gauge foreign perceptions of American restaurants and culture, and fast food restaurants are an easy barometer. It's also been many years since I've harbored any illusions that any popular travel destinations are hermetically sealed time machines, completely devoid of other tourists or influences from home. Wherever I go, I see American movies, travelers, books, music, and yes, more than a few frappuccinos and Big Macs. If a complete absence of anything American is the only way you'll be satisfied, then consider that your presence abroad is probably ruining some other travel snob's vacation. One last food story. I've always been a fairly adventurous, open-minded eater. My mom forced me to clean my plate, to sample something from every dish. Whether it was innate or trained, my broad palate has been with me for as long as I remember. It's a high risk, high reward dining strategy. 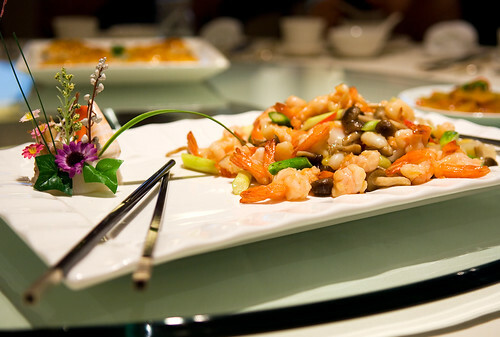 At times, as with drunken shrimp in Hong Kong, it ends with gustatory ecstasy. At other times, as with some bad (though tasty at the time of consumption) ceviche in Quito, it has sent me to the hospital. Last year during my visit to Beijing, a bunch of us went for a stroll down a well-known food alley near the Wangfujing neighborhood of Beijing. There, we stumbled upon more than one street vendor hawking some creatures I'd never thought of as food before. They were impaled on kabobs. The mere sight of them was fearsome, but after an initial bout of revulsion, I tried to summon my stomach, so to speak. More than few people from our travel party were there, and an audience usually amplifies my dining bravado. I asked the vendor how much for a kabob, and he said they were 10RMB, or just over $1. I took a deep breath. Okay, I'd eaten a fried grasshopper before, surely this was not much different. I could do this, and I'd have a story to share for years to come. After all, they were deep fried, right? The vendor reached out for one of the kabobs, for another customer, and that's when the true nature of what I'd be attempting became clear. These creatures' legs started waving wildly, even as they were impaled on the kabobs. "I thought they were fried!?" I gasped in Chinese. "No!" said the vendor, recoiling in horror. "Much better alive. Fresh!" I couldn't do it. We walked away, but not before I grabbed some video of these unique creatures, both pre and post skewering. These creatures should be familiar to most people (view either the 320 x 240 high quality or the 640 x 480 medium quality Quicktime clip, both about 3.5MB), though perhaps not as a snack. I'll eat most things, but not everything. I don't know who has the unfortunate job of having to prepare these creatures nor how they do it. I don't know how they ensure you aren't injured or even poisoned when biting one of these while they're still alive. You can ask for them deep fried, but even on my return trip this year I couldn't pull the trigger. After my initial encounter, just as we turned to leave, a young boy of perhaps 7 or 8 years old walked by with his father. The boy had a kabob of these and had chewed the head off of one. His t-shirt read: "You are what you eat."